The classic story of Aladdin has now come to the gaming screen with an exciting gameplay of regular game spins, bonus games, free spins and a progressive jackpot prize. You can vie with other gamers from around the world as you play Aladdin’s Wishes Slot at the Download or Instant casino on your PC or at the mobile casino on your smartphone or tablet device. The game has been mobile-enabled to provide mobile gamers with a gaming episode that offers images and tools that are specifically designed for the small screen. 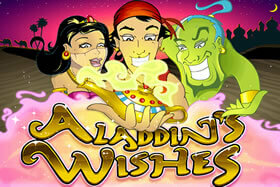 Aladdin’s Wishes Slot machine features 20 paylines that are full of of engaging and dynamic symbols. The game’s 95% RTP makes it a high-payout slots. You can play Aladdin’s Wishes at a level that you prefer — place a low level bet of as low as 1 coin of .01 or move up as high as a 1 coin bet of a .25 coin size. Note that since Aladdin’s Wishes slots is a progressive game, there is no Free Mode play – it is available only for play in Real Mode. The story of Aladdin, a ne’er do well whose fortunes take a turn for the best after conjuring a magical genie, is one of the world’s best-loved tales. The story is included in the classic Arabian Nights book of One Thousand and One Nights. For centuries the tale of Aladdin has fascinated and enthralled readers around the world. Now gambling aficionados can simply pick up their gaming device and participate in Aladdin’s adventures through spins and wins. The slot machine symbols include Aladdin’s Genie, a vase, a bowl of fruit, a magic carpet a sword, a crown, the princess, a monkey and Aladdin’s magic lamp. The Aladdin symbol is the game’s Wild. The Wild can substitute for any other symbol to complete a payline. Paylines that include a Wild symbol pay out a double payout. Using this wild symbol is the only way to get the full 10,000 coin jackpot. You can enable as many of the 20 paylines as you want but it’s important to remember that only those paylines that have been enabled with a bet will pay out on matching symbols. Five Princess symbols delivers a win of $5000 while four Princess symbols plus a Wild delivers a win of $10,000. The scatter symbol in Aladdin’s Wishes slot machine is the Magic Lamp. Two scatter symbols, appearing in any position on the reels (not necessarily on the same reel or payline) doubles your payout. If you achieve three or more of the Scatters on the screen at the same time you’ll trigger the Magic Lamp Bonus Game. The game transports you to a new screen where you are presented with five lamps. Pick the real lamp. If the Bonus game was launched with three magic lamp scatter symbols, then you get three chances to select the right lamp. If there were four scatter symbols that launched the Bonus Game you’ll get four chances to guess. A correct guess in the bonus game delivers 25 free spins. Any winnings that occur during these free spins pay out at a double rate. If you select a lamp that comes with an improved bonus, the bonus will grow with the possibility of an ultimate 100x multiplier! 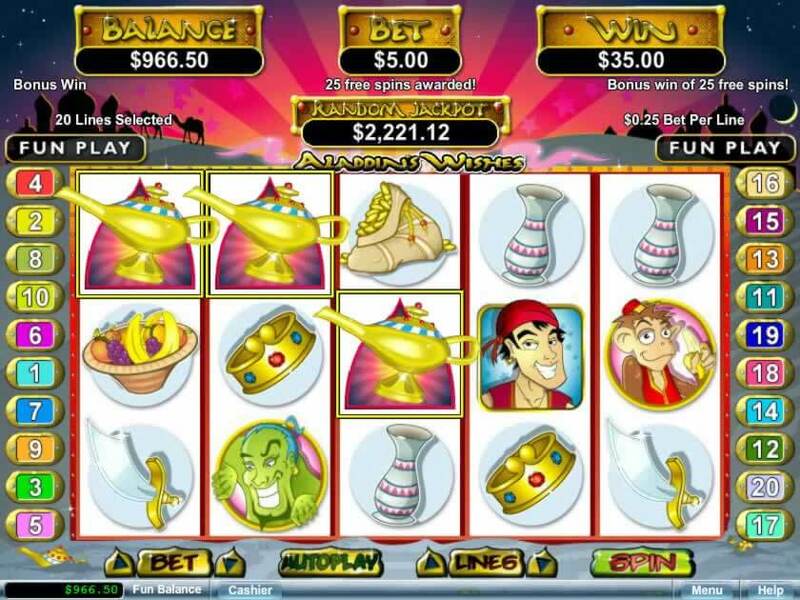 Aladdin’s Wishes is a progressive jackpot game in which the random jackpot is awarded to the player who spis the winning spin. Players compete against each other from around the world. Every gamer who adds a progressive jackpot wager to his regular game deposits will be invited to compete. The player who hits the jackpot takes home the entire jackpot prize. This refreshing, graphically-pleasing, jackpot slot has a lot to offer on your way to the big win. Bonus games, free spins, up to 100x multiplier and more. We’re sure you’ll enjoy playing Aladdin’s Wishes Slot for a slots adventure of fun, excitement and real money wins.